Hanoi (VNA) - As many as 1,000 scholarships and 5,000 gifts are expected to be offered to children from difficult backgrounds under the programme called “Thap sang nhung uoc mo” (To light up dreams) this year. 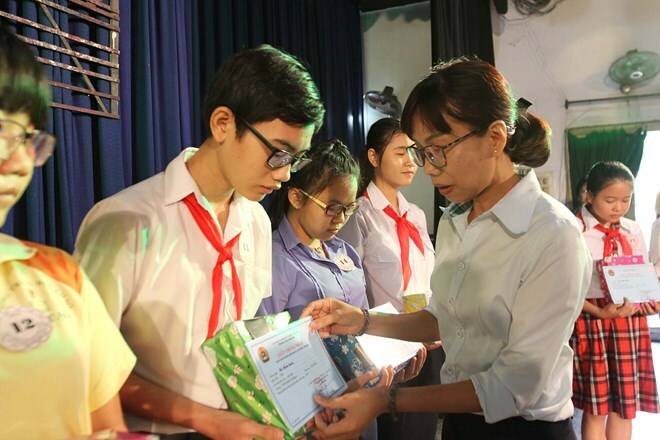 The scholarships and the gifts are worth at least one million VND (44 USD) and 500,000 VND (22 USD) each, respectively, said the Vietnam Association for Protection of Children's Rights (VAPCR) on August 2. The programme, the 4th version, aims to encourage and honour outstanding students who have overcome their difficulties to obtain good results in their study, as well as enterprises and donors for their support for the programme. As scheduled, the VAPCR will present 450 scholarships and 105 presents to disadvantaged children in Dak Nong, Dak Lak, Tien Giang, Hau Giang, Bac Lieu, and Tra Vinh provinces from September 8-30, while handing over scholarships and gifts to 50 others from northern provinces in Hanoi on September 23. VAPCR Vice President Ninh Thi Hong said the association has mobilised half of the expected scholarships and gifts, expressing her hope that the association will continue receiving support from organisations and individuals to help needy children. The programme’s main event will be organised in the Mekong Delta province of Ben Tre on October 1 on the occasion of the Mid-Autumn festival which falls on October 4. As many as 250 scholarships and 30 gifts are will be presented to needy children during the event.